Home / Kohaku / Reflections - Future focus on Kohaku. Going to stop Sanke, and possibly Shiro. The most recent kohaku spawning. Same males as the early summer spawning, but the female is different. The fry are doing well in horseshoe fry pond and I can't wait to do first selection and to see what the differences are in the fry from this kohaku parent set vs the early summer spawning - where only the female is different. - I didnt keep the eggs from the test spawning and one other spawning where most of the eggs were not viable when they were laid. - kokaku grown on to inch size in chestnut pond. I kept around 25% of them which are now approaching 3 inchs in a recirculation pond in the polytunnel. 2nd selection is overdue. - I lost most of the shiro hatchlings in the fry pond due to gas bubble disease. 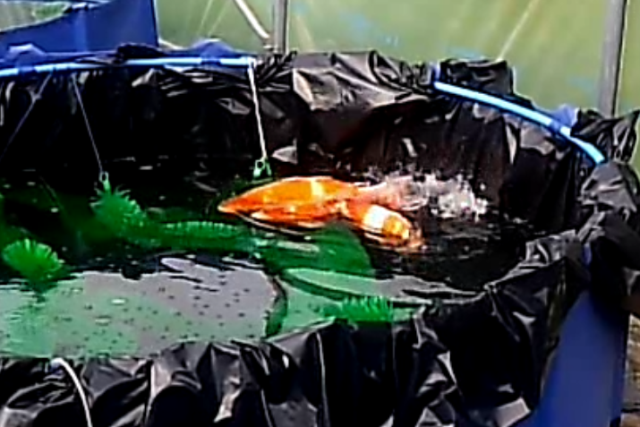 diagnosed through observing koi swimming on the surface of very green water. resolved for my late summer spawnings by improving water movement in the fry ponds to reduce the risk of this occuring again. I harvested around 200 fry, and I've kept around 10% to 20% - they are growing on with the kohaku fry in the polytunnel. they are very interesting to observe, and there are some that I might keep after second selection. - shusui, kohaku and (a few) showa hatchlings doing well in the fry ponds! I expect to harvest them towards the end of September / beginning of October. - the yamabuki female didnt spawn, and I don't know why. perhaps I need to play different music next time. - the first spawning I attempted was with a kohaku female. looking at her, you'd think she has eggs. I sought advice from Mark Davis about how to inspect female koi for eggs, and when I did the inspection she had no eggs! I held onto her for the rest of the summer to see if she developed any, but still none. So, I've moved her on. Spread too thin! It was tough to find koi that are good enough for me to use in the project and also at a price that I can afford, so I collected what I could find. And I collected females and males over the winter 2012 / spring 2013 based on what I could find and pieced together the brood sets as I went. Now, having done the spawnings this year I have a chance to reflect, adjust and build. - kohaku - this will be my main focus moving forwards. I've done 2 separate kohaku spawnings in 2013 which will give me some useful brood set combo intel. I have multiple untested female / male combination options and in 2014 I want to go through a brood set optimisation process to find the best combination. That might take me 2015 aswell, and by 2016 I want to have optimised brood pairings and then go large with those parent set combo's. I wouldnt rule out further investment in kohaku males so that by 2016 I have two parent sets that regularly produce really good kohaku that I can exhibit at koi shows. - sanke. this is a big decision, because I have two great sanke males. but, the female showa I picked up recently is such a good prospect that I need to focus on making the most of her, and sanke will have to make way to enable me to do that. - shusui - I expect to hang onto the parent fish as they spawned well and produced lots of hatchlings. - shiro. as I build on kohaku and showa, I may end up having to drop shiro, or at the very least, keep the parent set but as a backup only. The first shiro spawning was very successful to the hatchling stage, and I have unfinished business with them because bad luck in the fry pond led to me losing almost all the hatchlings within the first 24 hours - so I havent seen enough fry to know whether I've chanced on a good parent set match. But I have limited space, time and resources, and to achieve my project aims I may have to make the tough call to stop with the shiro so I can focus on kohaku and showa. -yamabuki, kujaku; neither of these brood sets produced fertilised eggs, and both will probably take more investment in alternative parent fish to make them work. I like these varieties, but further spend to make them work is unattractive. it would be interesting, and potentially useful to have a metallic option though. I have some big decisions ahead this winter. What to do with the shiro and my male sanke's are among the biggest decisions. Hi Bryan; looks like you caught up with some of the pics in my other posts from your other comment. I'll have some better pics when I have them in an inspection bowl for second selection.